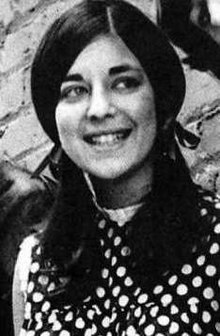 Signe Toly Anderson (/ˈsɪɡni/ SIG-nee; September 15, 1941 – January 28, 2016) was an American singer who was one of the founding members of the American rock band Jefferson Airplane. Anderson was a locally known and well-respected jazz and folk singer in San Francisco, where Marty Balin heard her perform and invited her to join his band, soon named "Jefferson Airplane". Soon after joining the Airplane, she married one of the Merry Pranksters, Jerry Anderson, a marriage that lasted from 1965 to 1974. She sang on the first Jefferson Airplane album, Jefferson Airplane Takes Off, most notably on the song "Chauffeur Blues". Anderson distrusted the Airplane's original manager, Matthew Katz, and refused to sign a contract with him until he inserted a special escape clause freeing her from him if she left the band for any reason. In July 1966, Anderson informed Bill Graham that she was quitting the band after a series of shows they were playing in Chicago, realizing that bringing her newborn child, with then-husband Jerry Anderson, on the road was not feasible. Graham, however, asked her to stay with the band through the October shows at the Winterland Ballroom in San Francisco, to which she agreed. This gave the band time to search for her replacement, eventually choosing Grace Slick after Sherry Snow declined their offer. Allegedly there were other factors, such as the hostility of other band members towards her husband. Anderson's last live performances with the Jefferson Airplane were two sets on October 15, 1966 at The Fillmore. Both performances were recorded (as were most Fillmore shows) and have surfaced on some bootleg albums. At what seemed to be the end of the second set, Marty Balin announced that Anderson was leaving the group. Her farewell to the audience was: "I want you all to wear smiles and daisies and box balloons. I love you all. Thank you and goodbye." At several fans' request, Anderson and the band performed her signature number, "Chauffeur Blues". They finished the night with "High Flying Bird". In August 2010, Collector's Choice music in cooperation with Sony released this show as Jefferson Airplane: Live at The Fillmore Auditorium 10/15/66 Signe's Farewell. After leaving the Airplane, Anderson returned to Oregon where she sang for nine years with a ten-piece band, Carl Smith and the Natural Gas Company. In the mid 1970s she recovered from cancer. In 1977 she married local building contractor Michael Alois Ettlin, and continued to sing with Carl Smith. In the mid 1990s, Anderson suffered further serious health problems, including a broken neck and bypass surgery, which led to serious financial problems for her family. She made guest appearances with the KBC Band and Jefferson Starship. Anderson's husband, Michael Alois Ettlin, died at the age of 62, on February 21, 2011. Anderson died at her home in Beaverton, Oregon at the age of 74 on January 28, 2016, from the effects of chronic obstructive pulmonary disease (COPD). She died on the same day as Airplane co-founder Paul Kantner, also aged 74. Her former bandmate Jorma Kaukonen wrote a public tribute honoring her, saying: "Signe was one of the strongest people I have ever met. She was our den mother in the early days of the Airplane… a voice of reason on more occasions than one… an important member of our dysfunctional little family. I always looked forward to seeing her when we played the Aladdin in Portland. She never complained and was always a joy." ^ a b Harrison, Iris (October 26, 2010). "Iris Harrison talks to Signe Anderson, founding member of Jefferson Airplane". KGON. Archived from the original on September 12, 2015. Retrieved February 13, 2016. ^ a b c d e "Signe Anderson, Jefferson Airplane Singer, Dies at 74". The New York Times. 2 February 2016. Archived from the original on 9 February 2016. Retrieved 4 July 2016. ^ Anderson, Signe (2011). "Interview: Signe Toly Anderson" (Interview). Interviewed by KGON. Portland, Oregon. ^ a b "Signe Anderson, Original Jefferson Airplane Singer, Dead at 74". Rolling Stone. 31 January 2016. Archived from the original on 17 July 2016. Retrieved 4 July 2016. ^ Tamarkin, Jeff (2003). Got a Revolution! : The Turbulent Flight of Jefferson Airplane. Atria Books. p. 52. ISBN 0671034030. ^ Unterberger, R. (2003). Eight Miles High: Folk-rock's Flight from Haight-Ashbury to Woodstock. Backbeat Books. p. 16. ISBN 9780879307431. Archived from the original on 2014-07-26. Retrieved 2015-08-30. ^ a b Tamarkin, Jeff (2003). Got a Revolution! : The Turbulent Flight of Jefferson Airplane. Atria Books. p. 105. ISBN 0671034030. ^ Valish, Frank (15 December 2010). "Jefferson Airplane Live at The Fillmore Auditorium 10/15/66 Late Show – Signe's Farewell". Under the Radar. Archived from the original on 8 August 2016. Retrieved 4 July 2016. ^ "Meet the Oregon Music Hall of Fame's Class of 2014". OregonLive.com. 3 October 2014. Archived from the original on 16 September 2016. Retrieved 4 July 2016. ^ Tamarkin, Jeff (2003). Got a Revolution! : The Turbulent Flight of Jefferson Airplane. Atria Books. p. 361. ISBN 0671034030. ^ "Signe Anderson, Jefferson Airplane's original singer, dies at 74... on the same day founding member Paul Kantner died". Daily Mail. 1 February 2016. Archived from the original on 6 May 2017. Retrieved 4 September 2017. ^ Stedman, Alex (31 January 2016). "Signe Anderson, Jefferson Airplane's Original Female Vocalist, Dies at 74". Variety. Archived from the original on 5 September 2017. Retrieved 4 September 2017. "The Ballad of You and Me and Pooneil"
"Layin' It on the Line"
"Nothing's Gonna Stop Us Now"
This page was last edited on 10 March 2019, at 18:52 (UTC).